Why PopStop and why does FRP (First Round Pop) matter? Home / Suppressors / Why PopStop and why does FRP (First Round Pop) matter? Most all suppressors experience the effects of FRP to varying degrees. However suppressor designs that incorporate baffle designs rather than monocore designs tend to exhibit less FRP. Additionally suppressors with larger blast chambers will tend to have louder FRP as the greater internal volume allows for more air. FRP matters because often times when silencers are use one shot needs to be taken. If silencers are used primarily to reduce sound and muzzle flash then measures can be taken to make them as effective as possible. And then there is PopStop, the first commercially available device designed specifically to eliminate first round pop and first round flash in silencers. 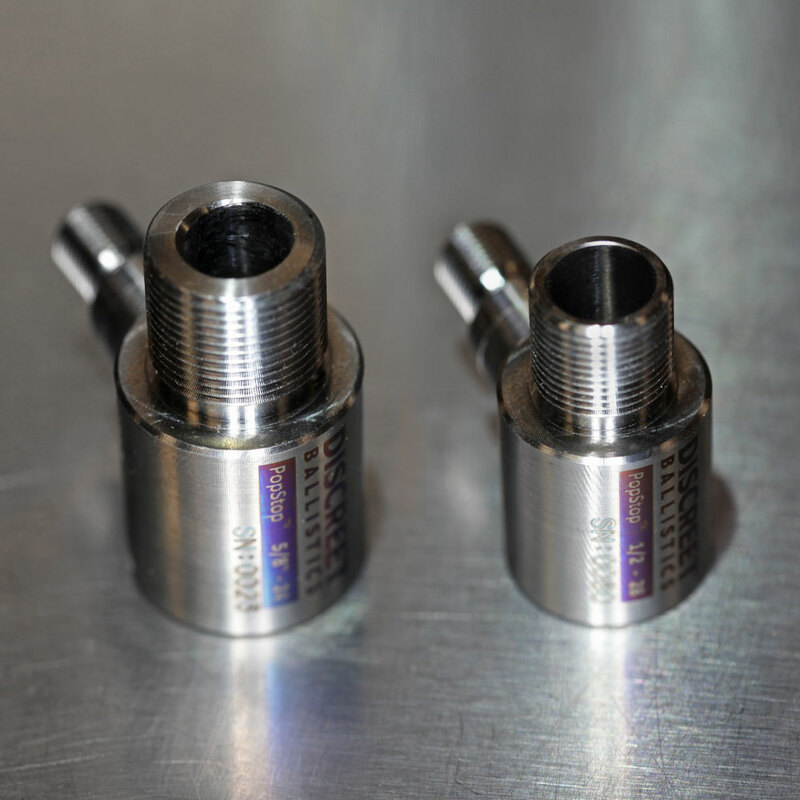 PopStop is a machined titanium accessory that facilitates the injection of CO2 into the blast chamber of silencers which temporarily displaces oxygen – the main cause of first round pop and first round flash. 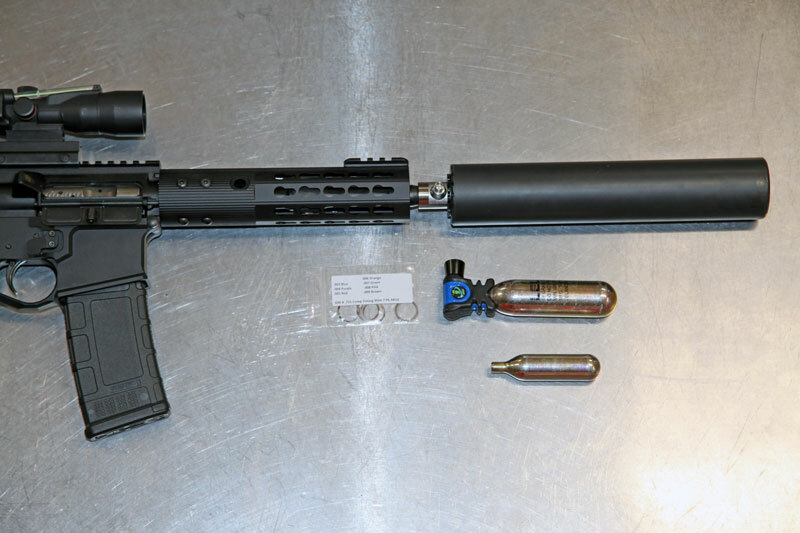 PopStop interfaces between barrel and suppressor and utilizes a valve that allows for an injection of inert carbon dioxide into the suppressor via commonly available carbon dioxide cartridges and handheld tire inflators. The result is a suppressor purged of oxidation gas (oxygen) and replaced with an inert gas (carbon dioxide). We’ve tested the effects of PopStop lasting up to five minutes with a one second injection. The effects can last even longer if a condom (or similar) is used to seal the end of the suppressor post-injection. Using a calibrated Larson Davis LxT-1 sound impulse meter our testing yielded a reduction of up to 9 dB by utilizing PopStop. Additionally, PopStop eliminates suppressor flash associated with FRP and can act to cool down the suppressor which helps reduce the POI (Point of Impact) shift commonly observed with certain suppressors. PopStop is available here in either 1/2-28 or 5/8-24 and comes included with a CO2 inflator, cartridges, condom, and color coded shim kit.